Special arrangement of the finest cars has to be made during weddings. Catering to all the need and requirement of the clients, at Shree Travels, we are offering Wedding Car Services at very reasonable charges. Located in Varanasi, Uttar Pradesh, we are counted among one of the top tour and travel companies involved in the process of providing Wedding Car Services for the valued clients. As a reputed company, we are well-known for offering finest quality cars that are available in their top condition. 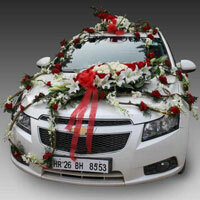 By availing the Wedding Car Services the clients can add the glamour which is very much needed during a wedding.